Hotel Normandie design had its inspiration in the steamer Normandie, a jewel from the French shipyards. The most striking and majestic of the Normandie was his town, whose slender bow with sinuous curves formed an acute angle that made it very different from existing ships and gave a way aerodynamics which, in addition to beauty, provided it faster navigation. During the period in which the architect Francisco Valines Cofresí was appointed first architect in charge of developing the Luis Muñoz Rivera Park scheme, was commissioned to make a preliminary project for a hotel in Puerta de Tierra "Barrio San Gerónimo". This blueprint into which then it would become in the hands of the architect Raúl Reichard in Hotel Normandie and then built in 1939 by Félix Benítez Rexach. 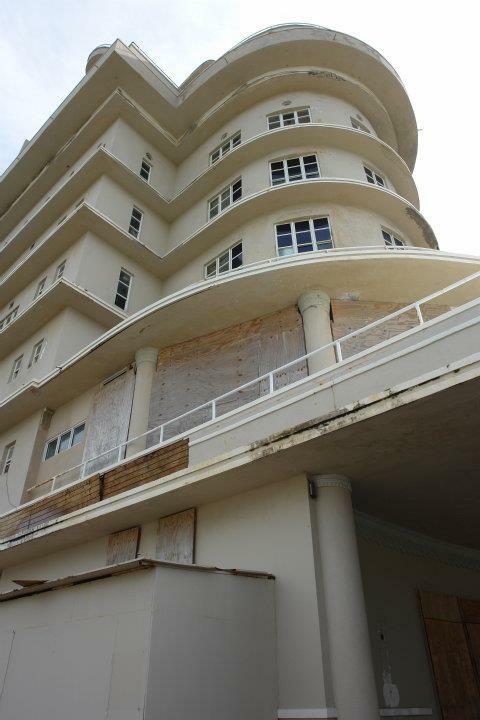 This building is an excellent example of the Art Deco style on the island. Hotel Normandie was the idea of the Puerto Rican engineer Félix Benítez. The engineer met his future wife, while a trip aboard the SS Normandie. As a tribute to his French wife, MOINEAU, Benítez decided to build a structure that imitated the configuration of the prodigious transatlantic. 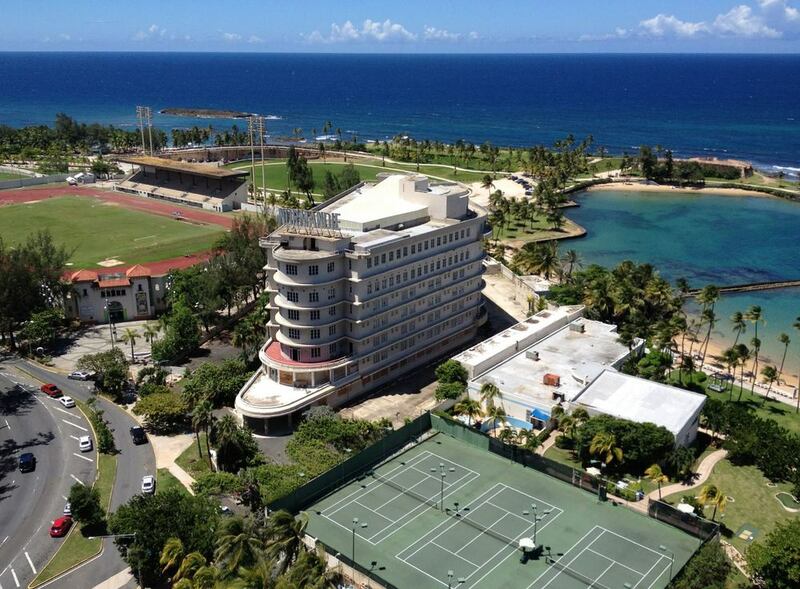 Designed by architect Raúl Reichard (1908-1996), the hotel began its construction in 1938. The shape of the building with slightly inclined walls remembered you the silhouette of the SS Normandie, so Benitez Rexach ordered the contractor - Dominican engineer José A. Iglesias - which added you three floors to the hotel and also a few balconies, by way of bridge, on the top floor. Félix Benítez Rexach and Luccienne Suzanne Dhotelle, alias Moineau, was part of the attraction of the new hotel Normandie. The couple had an apartment on the top floor, which were used when they were returning to the island of his travels by the Caribbean and the Mediterranean. Moineau was an exceptional woman who shocked the ladies of the capital society with her habits: she wore pants, smoked and drank; and lived with the same intensity of other destructive beings of the Archetypes of the feminine, as María Félix and Edith Piaf. The Normandie Hotel was one of the few luxury hotels that existed that time on the island. Its facilities were carried out social and political activities that make this building one of great historic and sentimental value for several generations of Puerto Ricans. Its forms represented the movement, modernism and technology. The interior was decorated with Egyptian-inspired motifs: Lotus Flower capitals, murals with scenes from Egypt and frieze with the motive of zigzag, all richly polychrome and decorated with gold leaf details. Egypt is a common theme of inspiration for Art Deco. 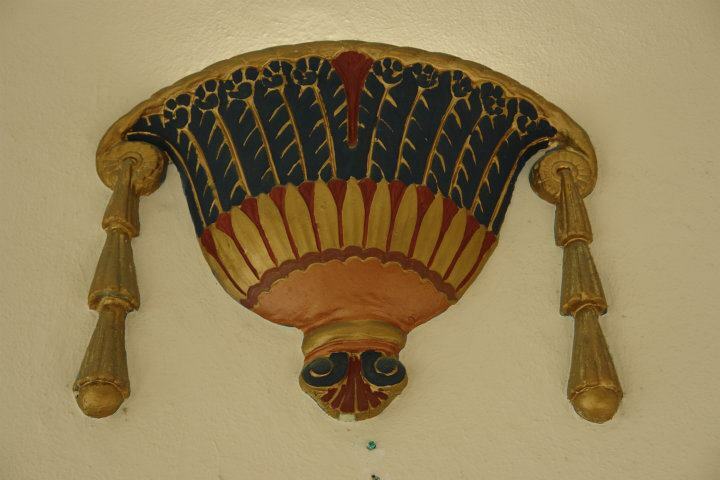 The main halls were decorated with polychrome plasterwork, tiles, lamps, mahogany furniture, murals, mirrors and all sorts of motifs in the Art Deco style. The lavishness of the Golden Hall, silver Salon and the Salon Victoria caused that the building was described as a Palace.Between 1939 and 1942, artists from France, Spain, Dominican Republic and Puerto Rico participated in the construction of the Normandie Hotel, whose cost was estimated at $2,000,000. The official opening was on October 10, 1942. The plant is triangular in shape with rounded corners. It is composed of seven floors organized around an inner courtyard and a basement. The lobby is small and includes the restaurant. On the first level there was a swimming pool, commercial areas, storage rooms, the main lobby and a rear entrance. From the second to the fifth floor rooms are with stairs and lifts in the Northeast and Southeast corners. On the sixth floor, there is a dance hall known as room of gold and a banquet hall known as room of silver. Also on this floor there is a dining room with kitchen and a large living room that was used as a casino. The seventh floor houses spacious rooms, a kitchen and a dining room. The machanical rooms are in the basement area. The Normandie was a door, a threshold of lights for the eager dancers’ delirium and sentimental rumba by artists such as Libertad Lamarque, Jorge Negrete, Olga Guillot, Cantinflas, Pedro Vargas, María Antonieta Pons, Toña La Negra and María Luisa Landín. The magical space of the Normandie was setting also for local artists such as Ruth Fernández, Myrta Silva, Joe Vallejo, Silvia Rexach, Carmen Delia Dipini, Tito Enríquez, Rafael Muñoz and José Luis Moneró. After being closed and abandoned in the 1960s, the Normandie Hotel was restored to early 1990. The Normandie hotel closed its doors in 1998 after having suffered extensive damage as a result of the scourge of Hurricane Georges. At that time Unanue and his partner Andres "Bubo" Gomez, senior executives of Normandie Limited Partnership (NLP), had decided not to invest in repairing the property which had left them billions of dollars losses in recent years. They said at the time, would remain closed until ownership was resolved a dispute that held up with the Corporation for the economic development of the Capital City (COFECC) or appear a buyer willing to pay a reasonable price for the hotel. It remained so for several years, until 2005 when it reopened after an extensive and costly remodeling that entailed an investment of $7 million. According Yaritza Santiago Caraballo from El Nuevo Día, Caribbean Property Group, institutional investor in the United States specializing in investing and managing real estate internationally, acquired the Normandie in 2006 for $ 34 million and its initial plans were to renovate the property and turn it into a luxurious Inn four stars, under the W Hotels brand. But business is not materialized, and according to sources choose to bring Puerto Rico to Thompson Hotels, a chain that stands for driving luxury hotels with sophisticated styles and high service. In its urban setting, the building is distinguished by an awesome neon sign that announces, showing in all his glory his name. The structure was remodeled in recent years and maintains its historical use with some modifications. Its scale and architectural style distinguish it as a landmark at the entrance to the San Juan islet. The Normandie Hotel was included on August 29, 1980 in the national register of historic places. 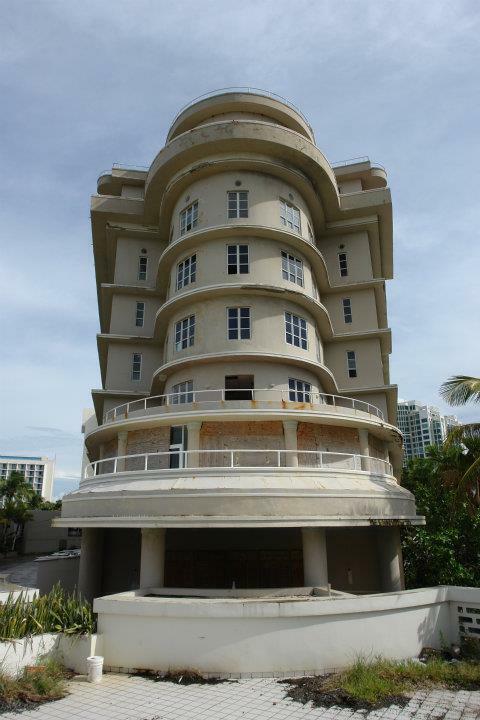 Its location pay its importance since it makes this building a visual landmark at the entrance of the San Juan islet. El diseño del Hotel Normandie tuvo su inspiración en el vapor Normandie, la joya de los astilleros franceses. Lo más impactante y majestuoso del Normandie era su casco, cuya esbelta proa con sinuosas curvas formaban un ángulo agudo que lo hacía muy diferente de los buques existentes y le daban una forma aerodinámica que, además de belleza, le proporcionaban mayor rapidez en la navegación. Durante el período en que el arquitecto Francisco Valines Cofresí fue nombrado primer arquitecto a cargo de desarrollar el esquema de el Parque Luis Muñoz Rivera, se le comisionó para que hiciera un anteproyecto para un hotel en el "Barrio San Gerónimo" de Puerta de Tierra. Este anteproyecto inició lo que luego se convertiría en manos del arquitecto Raúl Reichard en el Hotel Normandie y luego construido en 1939 por Félix Benítez Rexach. 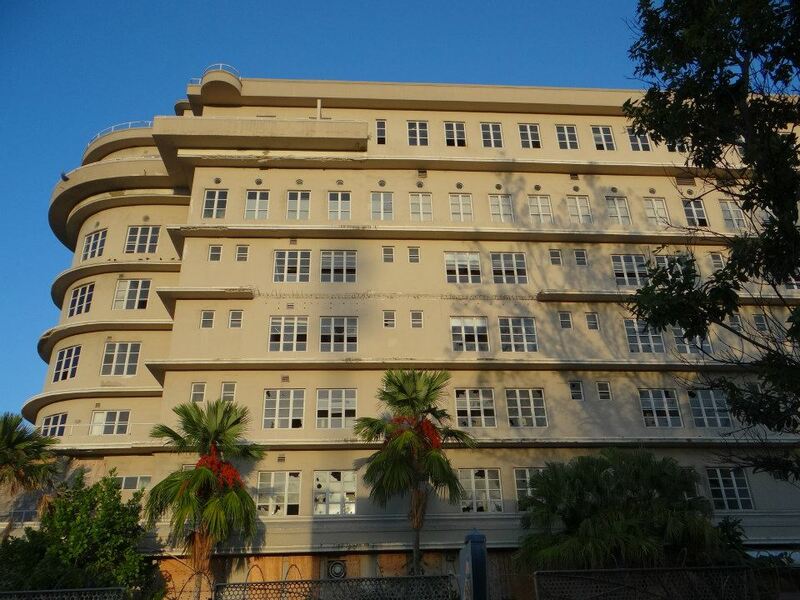 Este edificio es un excelente ejemplo del estilo Art Deco en la isla. El Hotel Normandie fue la idea del ingeniero puertorriqueño Félix Benítez. El ingeniero conoció a su futura esposa, mientras realizaba un viaje abordo del SS Normandie. Como un homenaje a su esposa francesa, MOINEAU, Benítez decidió construir una estructura que imitaba la configuración del prodigioso transatlántico. Diseñado por el arquitecto Raúl Reichard (1908-1996), el hotel comenzó su construcción en 1938. La forma del edificio con paredes ligeramente inclinadas le recordaba la silueta del SS Normandie, por lo que Benitez Rexach ordenó al contratista -el ingeniero dominicano José A. Iglesias- que le añadiera tres pisos más al hotel y además unos balcones, a manera de puente, en el último piso. Félix Benítez Rexach y Luccienne Suzanne Dhotelle, alias Moineau, formaba parte del atractivo del nuevo hotel Normandie. La pareja tenía un apartamento en el último piso, el cual utilizaban cuando regresaban a la isla de sus viajes por el Caribe y el Mediterráneo. Moineau era una mujer excepcional que escandalizó a las damas de la sociedad capitalina con su forma de ser: usaba pantalones, fumaba y bebía; vivía con la misma intensidad de otros seres destructores de los arquetipos femeninos, como María Félix y Edith Piaf. El Hotel Normandie era uno de los pocos hoteles de lujo que existían para ese tiempo en la isla. En sus instalaciones se llevaron a cabo actividades sociales y políticas que hace de este edificio uno de gran valor histórico y sentimental para varias generaciones de puertorriqueños. Sus formas representaban el movimiento, el modernismo y la tecnología. El interior estaba decorado con motivos de inspiración egipcia: capiteles de flor de loto, murales con escenas de Egipto y frizos con el motivo de zigzag, todo ricamente policromado y adornado con detalles en pan de oro. Egipto es un tema común de inspiración para el Art Deco. Los salones principales estaban decorados con yesería policromadas, azulejos, lámparas, muebles de caoba, murales, espejos y toda clase de adornos en el estilo Art Deco. La suntuosidad del Salón de Oro, del Salón de Plata y del Salón Victoria provocaron que el edificio fuera descrito como un palacio. Entre 1939 y 1942, artistas de Francia, España, República Dominicana y Puerto Rico participaron en la construcción del Hotel Normandie, cuyo costo se estimó en $2,000,000. La inauguración oficial fue el 10 de octubre de 1942. La planta tiene forma triangular con vértices redondeados. Está compuesto por siete pisos organizados alrededor de un patio interior y un sótano. El vestíbulo es pequeño e incluye al restaurante. En el primer nivel había una piscina, áreas comerciales, cuartos de almacenaje, el vestíbulo principal y una entrada posterior. Del segundo al quinto piso se encuentran las habitaciones, con escaleras y ascensores en las esquinas noreste y sureste. En el sexto piso hay un salón de baile conocido como Salón de Oro y un salón de banquetes conocido como Salón de Plata. También en este piso hay un comedor con cocina y un salón grande que fue utilizado como casino. El séptimo piso alberga amplias habitaciones, una cocina y un comedor. En el sótano se encuentran los cuartos mecánicos. El Normandie fue una puerta, un umbral de luces para el delirio ansioso de los bailadores y la rumba sentimental de artistas como Libertad Lamarque, Jorge Negrete, Olga Guillot, Cantinflas, Pedro Vargas, María Antonieta Pons, Toña La Negra y María Luisa Landín. El espacio mágico del Normandie fue escenario también para artistas locales como Ruth Fernández, Myrta Silva, Joe Vallejo, Silvia Rexach, Carmen Delia Dipiní, Tito Enríquez, Rafael Muñoz y José Luis Moneró. Luego de ser cerrado y abandonado en la década del sesenta, el Hotel Normandie fue restaurado a principio del 1990. El hotel Normandie cerró sus puertas en 1998 tras haber sufrido cuantiosos daños a consecuencia del azote del huracán Georges. En aquel momento Unanue y su socio Andres ""Bubo"" Gomez, principales ejecutivos de Normandie Limited Partnership (NLP), habían decidido no invertir en reparar la propiedad que les había dejado pérdidas millonarias en los últimos años. Según dijeron en ese entonces, mantendrían la propiedad cerrada hasta tanto se resolviera un litigio que sostenían con la Corporación para el Fomento Económico de la Ciudad Capital (COFECC) o apareciera un comprador dispuesto a pagar un precio razonable por el hotel. Así permaneció por varios años, hasta el 2005 cuando reabrió sus puertas luego de una extensa y costosa remodelación que conllevó una inversión de $7 millones. Según Yaritza Santiago Caraballo de El Nuevo Día, Caribbean Property Group, inversionista institucional de los Estados Unidos especializado en invertir y administrar bienes raíces a nivel internacional, adquirió el Normandie en el 2006 por 34 millones de dólares y sus planes iniciales eran renovar la propiedad y convertirla en una lujosa hospedería cuatro estrellas, bajo la marca W Hotels. Pero el negocio no se concretó, y según las fuentes optan por traer a Puerto Rico a Thompson Hotels, una cadena que se destaca por manejar hoteles de lujo con estilos sofisticados y alto servicio. En su entorno urbano, el edificio se distingue por un imponente letrero de neón que anuncia, fulgurando en todo su esplendor su nombre. La estructura fue remodelada en años recientes y mantiene su uso histórico con algunas modificaciones. Su escala y estilo arquitectónico lo distinguen como un hito en la entrada a la isleta de San Juan. El Hotel Normandie fue incluido el 29 de agosto de 1980 en el Registro Nacional de Lugares Históricos. Su localización abona a su importancia ya que convierte este edificio en un hito visual en la entrada de la isleta de San Juan.